The result, you receive a beautiful interlocking cedar frame, that stacks together like a little log house. It comes completely finished with a high quality weather proofing wood stain. You can mix and match the frame rails to create the look you like and highlight the natural beauty of the western red cedar. The interlocking notches are cut in the same direction, so you simply can't re-assemble it wrong. 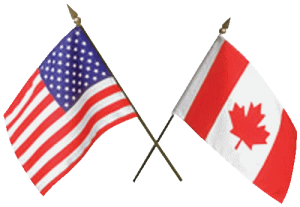 We offer a Lifetime warranty against warped or cracked cedar! 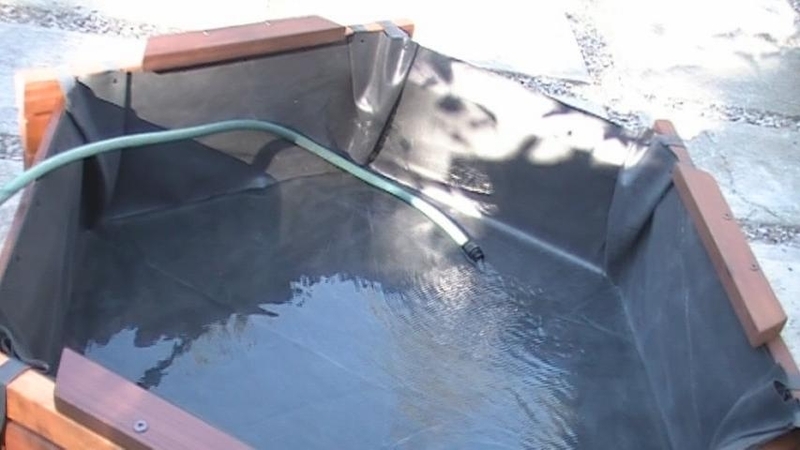 An EPDM Firestone Pondgard fish and plant safe, preformed pond liner and a foam ground pad are included. This nontoxic, 0.45 mil thick pliable 'rubber like' material, is custom built into the correct shape, with its own weatherproof frame. You simply open it and place in into the frame on top of the pre-cut foam ground pad. Again, it fits a certain way so you can't get it wrong! This Firestone liner has a 20 year warranty against breaking down from either UV rays of the sun, or from the cold. 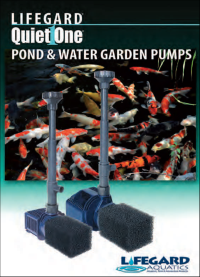 A "Quiet One" magnetic drive pond pump, over-sized to exceed the needs of your pond is included. (This extra circulation volume provides lots of oxygen for happy fish, thriving water plants, and easier pond maintenance.) Place the pump in the center of the pond. These submersible pumps come with a 20 foot cord, (that comes out through the small gap under the bottom of any bench) so it has a good reach to plug into a 110v GFI protected outlet. Every pump comes with a foam pre-filter on the intake side of the pump. Easy to clean, just sit on the bench, reach in and slide the filter off the intake stem on the pump, rinse it out, and slide it back into place. The filter is re-usable, so you're not always buying filters. Every pump comes with 3 water fountain styles. 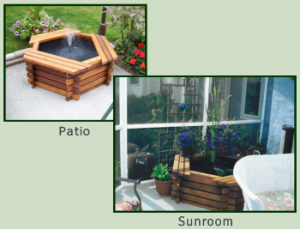 You can switch them out to create your favorite backyard water features, and help control humidity and water evaporation. Pre-assembled Western Red Cedar benches are included and come ready to simply slide into place on the frame. (Designed to go into place only one way, so again you can't get it wrong.) The benches provide seating, and you are sitting on a solid stack of interlocked cedar, so they are very strong. They're secured to the frame by inserting 2 screws thru the pre-drilled holes at each end, using the 12 screws and screwdriver provided with your pond kit! IT WILL TAKE YOU LONGER TO ADD THE WATER, THAN TO SET UP YOUR POND. You keep control of your landscaping or building project. You choose which size, when, and where to set up your pond. 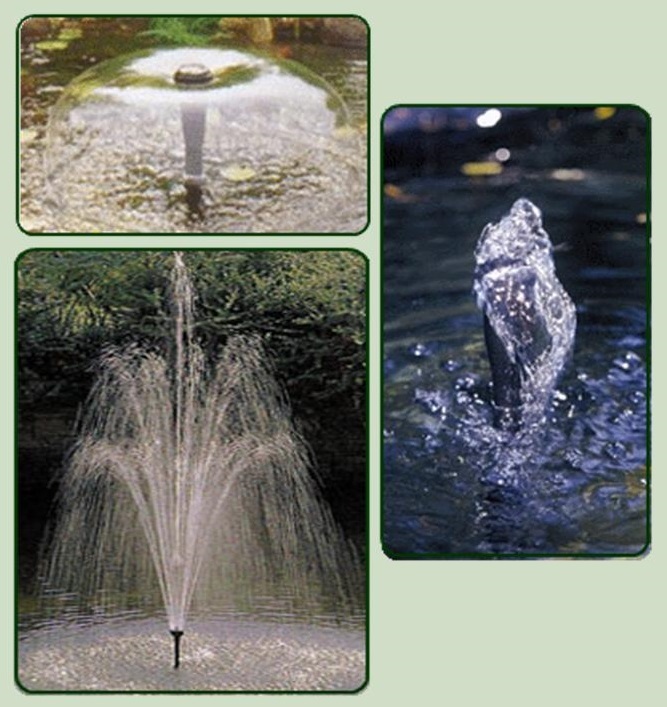 You choose whether you want fish, turtles, aquatic plants, or simply a beautiful water feature. You decide. We provide you with a D.I.Y. 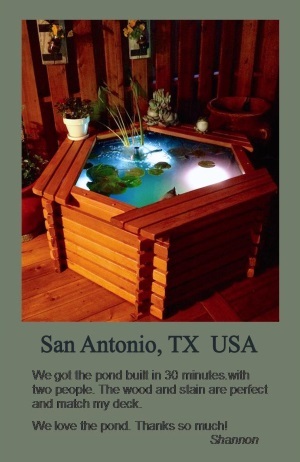 pond kit designed to be easy to set up, low maintenance, and sized to meet your needs. Just reassemble and add water. WE DO THE HARD PART - YOU DO THE EASY PART! 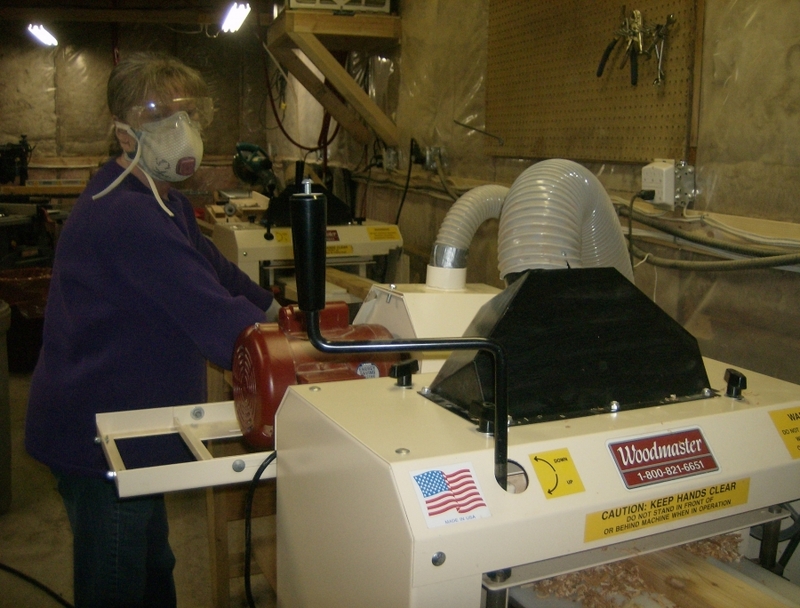 Each piece of cedar is air dried to achieve the optimal moisture content, then its cut and planed to size. The cedar is then hand sorted, sanded on all surfaces, and finished with two coats of a high quality, environmentally friendly, weatherproofing wood stain, using back brushing for maximum performance and protection from the elements. The result is a beautiful frame and benches ready for easy set-up right out of the box. The preformed pond liner comes folded and rolled. We add a partial frame of arena board attached with nylon rivets to give the liner its correct shape. The butterfly corners are made using aluminum rivets for strength and years of service. While it looks like the liner is attached to the wooden frame, it isn't. The frame and the water hold the liner in place. All you need is a fairly level surface for your pond, and a garden hose to fill it. Our unique interlocking frame simply stacks together like a little log house. The preformed pond liner is sized to fit the frame, and the benches come already assembled. There are only 12 screws (to fasten the benches to the pond) in the whole set-up. We even include the screwdriver! Check out our easy set up videos. You can feel secure in knowing that 'Pondgard' liner is considered the world's safest liner for fish. Made by Firestone, Pondgard liner is nontoxic, and is not affected by the UV rays of the sun. This liner remains pliable even at -40 degrees, and comes with a 20 year warranty against breaking down from the sun or the cold. We form the liner by building its own partial frame made of arena board. This specialty HDPE (High Density Polyethylene) is also unaffected by the sun or the cold, and is attached with rivets to the top of the liner to give the liner the correct shape, and make your set-up easy. We've attached looped straps on each corner to help align and hold the liner in place as you install it. This makes it easy for one person to do the entire set-up of even our largest sized ponds. The beautiful wood frame is made from hand selected 'coastal' western red cedar. 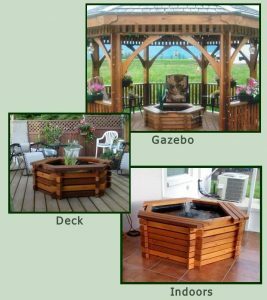 Western Red Cedar is not only one of the most beautiful looking (and smelling) specialty woods in the world, but is also one of the most durable for outdoor use. Coastal cedar grows in rain-forest like conditions in the Pacific Northwest, resulting in high moisture content and dense grains within the structure of the wood. 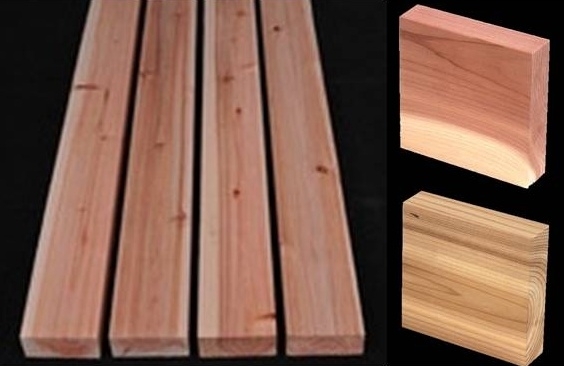 Coastal Western Red Cedar will outperform and outlast inland species of cedar when exposed to the elements. Properly finished, cedar will deliver decades of trouble-free service. We tried pumps from all corners of the world before deciding on Lifegard Aquatics' Pond Pumps of Southern California. These patented magnetic drive pond pumps come with three year warranties and a life expectancy of 10 to 12 years. The pumps are called 'Quiet Ones" for a very good reason. Our magnetic drive pond pumps use magnets rather than brushes to turn the pump making them extremely energy efficient, and perhaps equally important, very quiet. You can sit and listen to the soothing sounds of the water, rather than the humming noise from the brushes of a conventional pump. For example, our model 4000 pump circulates just over 1000 gallons of water per hour while drawing only 0.6 of 1 amp of 110 volt current. Our model 800 pump circulates 240 gallons per hour using just 0.24 of 1 amp, under a quarter of one amp. Running 24/7 in most areas will cost you about $1.00 per month. This factor's into creating a low maintenance pond! We know from our experience that most folks prefer a sunny location for their pond, and everybody wants to have as little maintenance as possible. Simply put, the more you circulate the water, the more oxygen goes into the water, and the easier it is to keep the water clean. The oxygen helps the beneficial bacteria thrive, which in turn helps control the bad bacteria that contributes to the growth of algae. Many folks in the pond industry recommend you size your pump to circulate your pond water once every hour in small ponds, and once every 2 hours in larger systems. We believe in more circulation. Our pond kits always include pumps sized to turn over the entire volume of water contained in your pond 2 to 3 times every hour, using energy efficient pumps that are inexpensive to run, and quiet enough you can enjoy the sight and sounds of the water 24 hours per day. The foam pre-filter protects the pump, stopping large debris from getting into the impeller. Good bacteria also thrive in this kind of media. Having a re-usable filter also makes these pumps more economical to operate. One customer at a Home and Garden show told us she had used her Lifegard pump for over 12 years, and was still using the original filter! Each pump comes with a riser stem (which gives you a steady stream of solid water for a gurgle or shooting water effect), a bell fountain head (which gives you an umbrella or bell shaped fountain), and a mist or spray (flower) fountain head. You can adjust the both the flow of the pump and the fountain heads to create a variety of effects. The frame, liner, pump, fountains, and filters, have been selected to provide ample water circulation to maintain high levels of oxygen in the water for the size of the pond. 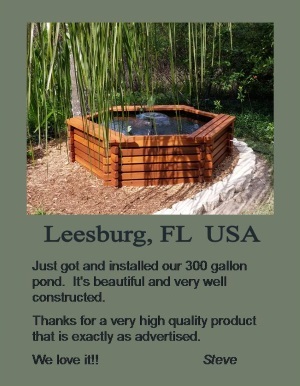 For folks who are placing their pond in full sun locations, have a large fish population, or koi, we offer an optional Lifegard "All-in-One" Pond Filter System. This compact, submersible filter system, includes a 13 watt ultraviolet sterilizer, both mechanical and biological filtration and compliments our larger pond kits. 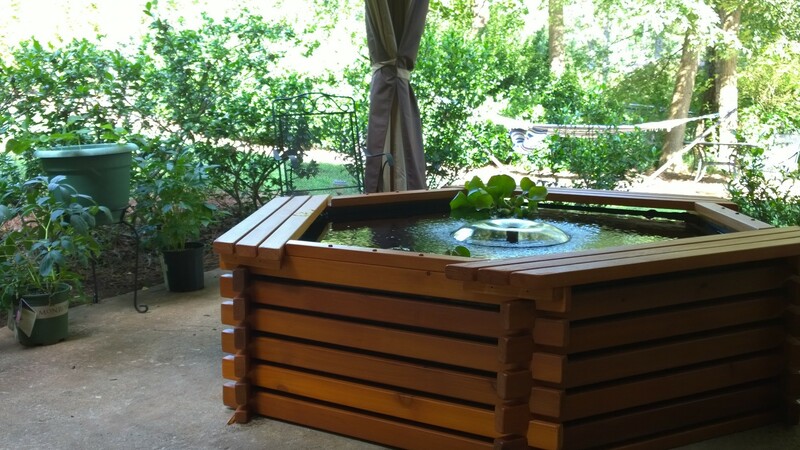 Everyone has a different amount of space available for a pond or water feature. 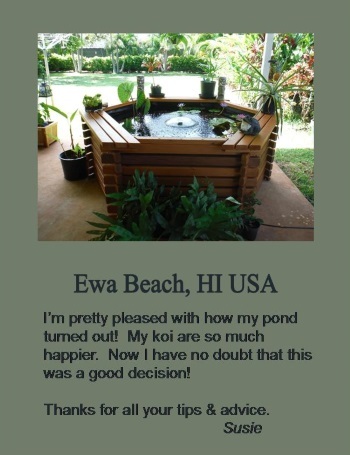 Our customers tell us that when deciding which size of pond to purchase, it was all about their space. 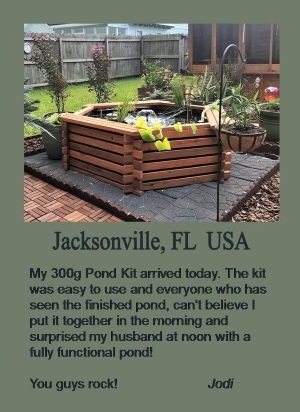 Whether it's that spot in the corner where nothing grows, or under the bay window on the patio, or that empty space on the deck, Kim has a pond kit sized to meet your needs. WHO BUYS KIM'S POND KITS? We have built and delivered over 1,200 pond kits to customers all over North America. 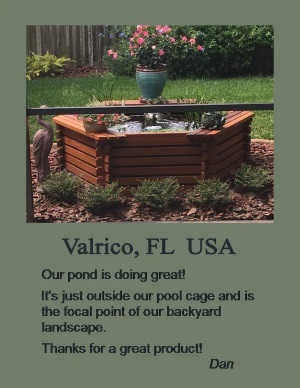 Customers love and use our ponds in the humidity of South Florida, the dry heat of Arizona, the milder climate of California, to the frigid temperatures of Northern Canada, and most areas in-between. 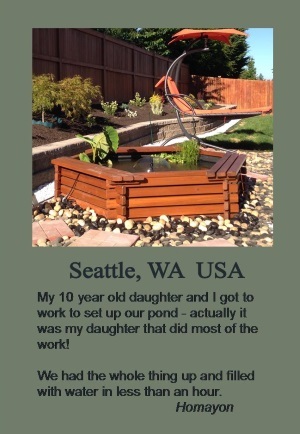 Kim's Ponds are not just beautiful to look at, but are strong, built to withstand the elements, and perform for many years, no matter where you live. 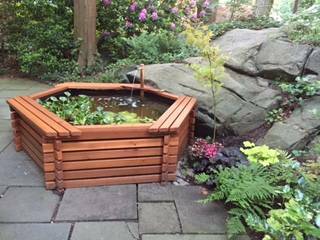 Kim's Pond Kits have been purchased as habitat for Koi, goldfish, orandas, and even a freshwater shark. Big turtles, little turtles, a pet swan, pet ducks and even one for a Labrador retriever to jump into on hot summer days. We have a customer who actually uses her 200 gal. as a salt water marine "aquarium". Aquatic gardeners love Kim's Ponds. They can sit on the benches and work with their water plants and flowers that are right at their fingertips. The water depth and pond size is perfect for many varieties of aquatic plants. A kitchen cabinet manufacturer has a pond in his showroom full of fish to keep the kids entertained while mom and dad buy their new kitchen. A gem-stone dealer in Alberta uses his pond as a display case for his showroom; filled with under water lights illuminating precious gemstones. "Precious stones have a different sheen and sparkle in the water" he explained when he purchased. 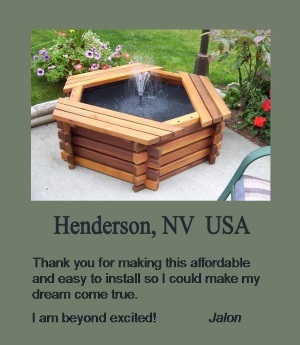 Other customers have used Kim's Pond Kits as catch basins for waterfalls or streams, as part of their larger water landscaping. 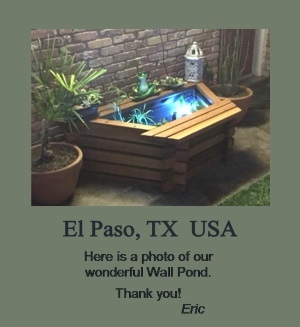 Even customers with large in-ground ponds will often purchase one of Kim's ponds to place on the deck or patio where they can sit on and enjoy the soothing effects of the water.